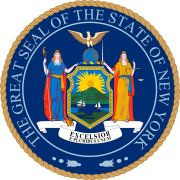 New York was won by the Republican nominees, former Governor William McKinley of Ohio and his running mate corporate lawyer Garret Hobart of New Jersey. McKinley and Hobart defeated the Democratic nominees, former Congressman William Jennings Bryan of Nebraska and his running mate industrialist Arthur Sewall of Maine. Bryan also ran and received votes on the Populist Party line, with running mate Congressman Thomas E. Watson of Georgia. Also in the running was the National Democratic Party (Gold Democrat) candidate, John M. Palmer of Illinois, who ran with former Governor of Kentucky Simon Bolivar Buckner on a platform advocating for the gold standard. McKinley carried New York State with 57.58 percent of the vote to Bryan’s 38.72 percent, a victory margin of 18.85%. Palmer came in a distant third, with 1.33%. New York weighed in for this election as about fourteen percent more Republican than the national average. Bryan, running on a platform of free silver, appealed strongly to Western miners and farmers in the 1896 election, but held little appeal in the Northeastern United States. Consequently, he performed especially weakly for a Democrat in New York, losing every county in the state except for Schoharie County upstate. This included New York City, where McKinley outpolled Bryan by about sixty thousand votes. McKinley would lose New York City to Bryan in their 1900 rematch four years later, and New York City would not vote Republican again until 1920. ^ "1896 Presidential Election Results - New York". Dave Leip's U.S. Election Atlas. Retrieved 2013-10-06. ^ Returns for Hamilton County were not separated from those for Fulton county when the 1896 election was compiled. This page was last edited on 15 January 2019, at 21:05 (UTC).